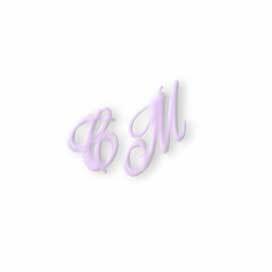 On Monday and Tuesday, September 22 and 23, 2003, Cheryl Miller's family and friends will join with medical marijuana supporters to memorialize her life and contributions to the medical marijuana movement. 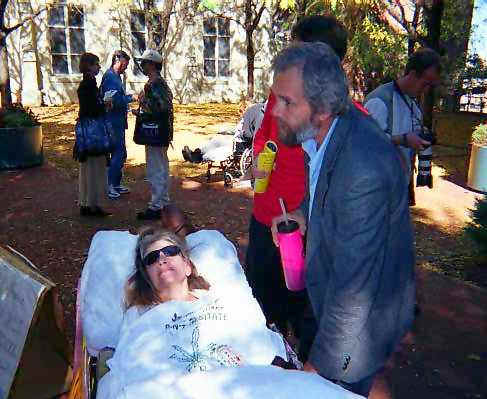 Though she was paralyzed by decades of multiple sclerosis, Cheryl and her husband and caregiver Jim waged a long and courageous battle so patients like Cheryl would not have to suffer when a safe medicine, marijuana, could be easily available were it not for politics keeping it illegal and out of the hands of those who could benefit. Cheryl's long struggle came to an end on June 7, 2003. As most of her friends were unable to make memorials in New Jersey and her native Oklahoma, Jim decided that it would be fitting to have a memorial for Cheryl in Washington, D.C., a city she had visited 9 times to help educate people about medical marijuana. For years, Cheryl had been wanting to do a candlelight vigil in Washington, but unfortunately that wish was not fulfilled in her lifetime. It will be fulfilled the evening of Monday, September 22, 2003, outside the U.S. Supreme Court. On Tuesday September 23, there will be a press conference and a day for medical marijuana patients and supporters to visit congressional offices to educate elected representatives about the realities patients face each day. And supporters who cannot make it to Washington will be encouraged to contact elected representatives in Washington in a coordinated national call-in day and participate in other local actions. 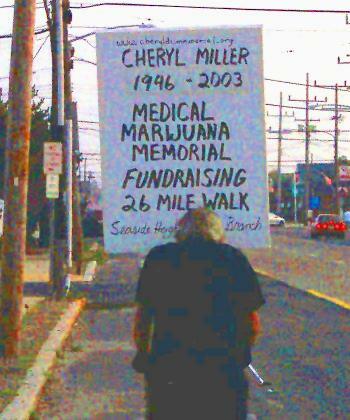 Most importantly, the Cheryl Miller Memorial Project needs your generous financial help to bring as many medical marijuana patients and supporters as possible to honor Cheryl's memory and to demonstrate to Congress and the federal government that it is time to take the long overdue step of ending this ongoing federal war on medical marijuana patients. Your donation will make a difference! August 30, 2003: Jim Miller pushed his late wife Cheryl's wheelchair 26 miles to raise funds for this project. 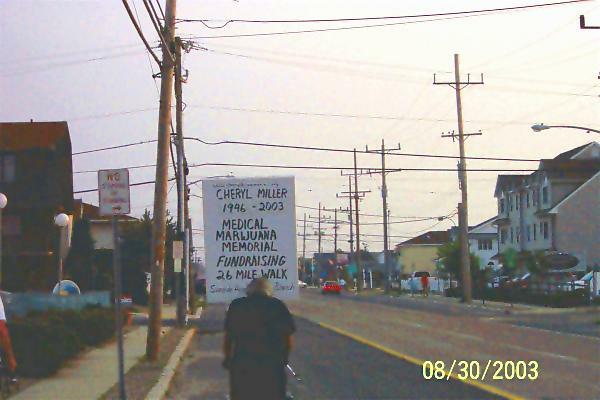 The Cheryl Miller Memorial Project is a collaboration of a number of drug policy reform groups and individuals including The Cherylheart Project, Is My Medicine Legal YET?, Americans for Safe Access, Drug Policy Alliance, Coalition for Medical Marijuana--New Jersey, DrugSense, DRCNET, MPP, New Jersey NORML, New York State Cannabis Action Network, New Yorkers for Compassionate Care, NORML, Ohio Patient Network, Ron Crickenberger, Libertarian for Congress, SSDP, Wisconsin NORML, with more participants to be announced.